The Boaters’ Handbook which is published on the British Waterways website and which can be downloaded as a PDF file is like a virtual equivalent to a motorist’s ‘Highway Code’. Firstly, you’ll encounter many different river and canal signs which are similar in format to the signs you’d see on any road but obviously they pertain to rules and regulations that must be followed if you’re travelling by boat on a waterway. It’s important that you learn what each of these signs mean as they are there for a purpose which will usually be related to your own safety and the safety of others. 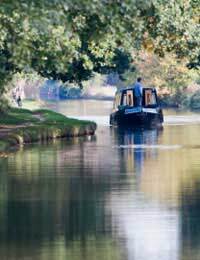 The Boaters’ Handbook will also give you plenty of additional useful and practical advice aimed at ensuring you have a pleasurable time on the waterways whilst underpinning all their advice will be to ensure safety for all who are using the river. Here are just some of the most important rules when using a waterway, many of which are also related to boating etiquette and British Waterways own guidelines which you will find in other articles contained on this website. It’s very rare that you’d need to overtake a moving boat on canals or rivers in the UK or that another boat would want to overtake you as the space is often narrow. However, if you do intend to overtake it’s important that you slow down and that you give the other skipper advanced notice of what you’re intending to do and how you’re intending to go about it. Remember that if you’re the one doing the overtaking, it is your responsibility to keep clear of the other boat and you need to manoeuvre slowly to avoid the possibility of the two boats being drawn together or of creating a wake which could cause the other boat to rock. Whenever you’re approaching a bridge or some other narrow section where perhaps only one craft can use a particular stretch of water at a time, you need to slow down and it’s the craft which is nearest to the bridge which should automatically be granted the right of way. Stop your boat and wave them through and keep well out of their way until they are clear. On rivers, it’s the boat that is heading downstream that has the right of way. For various reasons, it’s not always possible to make your manoeuvring intentions clear to another boat’s skipper verbally. However, communication problems are easy enough to get around as long as you understand the use of a horn device which all boats will have and what each of the blasts mean in terms of the number of blasts given and whether or not they’re short or long blasts and if they include any pauses or not. Once again, the Boaters’ Handbook explains this more thoroughly but each signal will mean things like telling another boat that it’s your intention to manoeuvre towards the left or the right, that you’re going to actually turn left or right, that your intending to stop or to reverse, that you cannot currently manoeuvre and these signals are also used as warnings in areas such as at bridges, junctions and blind bends to let other craft who may not be able to see you that you are close by. Sailing at night on British waterways is not really recommended or approved of unless absolutely necessary. And, on some stretches of water, cruising is forbidden after a certain time until daylight returns. If, however, you do intend sailing at night, it’s important to check with the relevant authority first to see if you’re permitted to do so. If you are, then it’s crucial that you understand and comply with the rules over the lights your boat needs to display. You need to have different coloured lights at both the front, back and on either side of your boat and these must be colour co-ordinated correctly so that all other craft are aware of boats that are coming towards them and the lights also indicate in which direction another boat is about to cross ahead of you, e.g. either from left to right or vice versa. There will always be speed signs on waterways which will be there to indicate your maximum speed and/or you’ll be given guidance by a harbour or yard master before setting off. However, it’s important to remember that the currents of a river can increase and decrease the speed of your boat and that you always need to slow right down when nearing bridges, junctions, locks or when passing anglers or other moored craft. Another good way of recognising that you’re travelling too fast is if you’re creating waves or your wash is regularly hitting the bank.